Contact us regarding your current and future fencing requirements. Aabot Fence has been a leading full service commercial fence installer in the greater Florida area for the past 30 years. We are fully insured and bonded for all levels of jobsite operation. 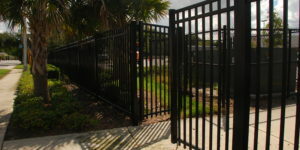 Our skilled workforce, professionalism, quality products, and dependable customer service have helped us build a reputation as a leader in the commercial/industrial fence construction industry throughout Florida.